Way back when, I made the mistake of listing off all the species I could think of whose genus names are the same as their species names. In short, their scientific name is the same word repeated: Bison bison, Chinchilla chinchilla, Iguana iguana, as well as the more exotic-sounding ones such as Bubo bubo (the Eurasian eagle-owl) and Mephitis mephitis (the striped skunk). I call the post a mistake because it’s subsequently only given some people the opportunity to point out how I’m an idiot for omitting their favorite same-name scientific creatures. Among those I skipped were Gulo gulo — the common wolverine, which I’ve just found out is called “skunk bear” in some circles — and the sea snail Volva volva volva, which, yes, is named for exactly the reason that you’d guess. But just before the end of 2014, another double-namer was brought to my attention that seemed worthy enough for its own post. Yep, Boops boops, a big-eyed little fish otherwise known as the bogue. Technically, that name is pronounced “BOH-ops BOH-ops” — literally “cow eye, cow eye” — but why not better the world and just refer to this guy as “BOOPS BOOPS”? The Wikipedia page for the species even has a perfectly reasonable, scientifically accurate caption that nonetheless sounds like it the chorus of some old-timey children’s rhyme. 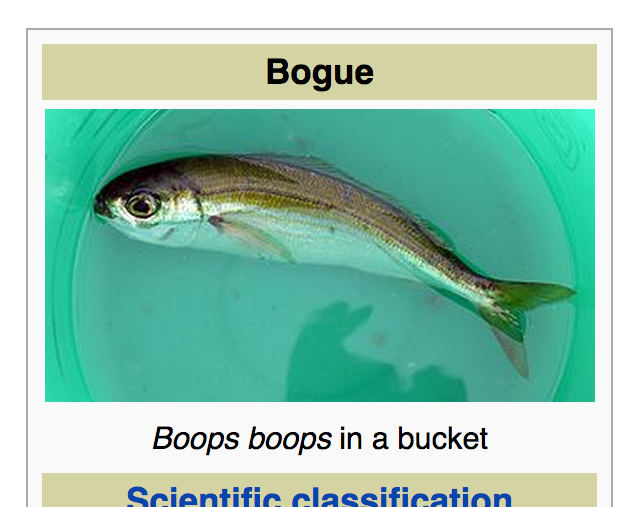 All hail Boops boops, your new favorite intersex Atlantic demersal and semi-pelagic feeding fish! And if I still haven’t mentioned your favorite double-named species, please notify me without calling me an idiot. Sounds like a catchy one-hit wonder. "Boops boops in a bucket!"... a la Sly and Robbie's "Fire"
Or a Dr. Seuss story. Also, Marvel needs to create a super-powered mutant called Skunk Bear.